The #1 premier used car dealer serving all of Hobart, Wheeler, Lake Station, Gary, Merrillville, Valparaiso, Portage, CrownPoint, Griffith, Schererville, Leroy, Highland, Chesterton, Hammond and beyond for great prices and fast, easy financing. 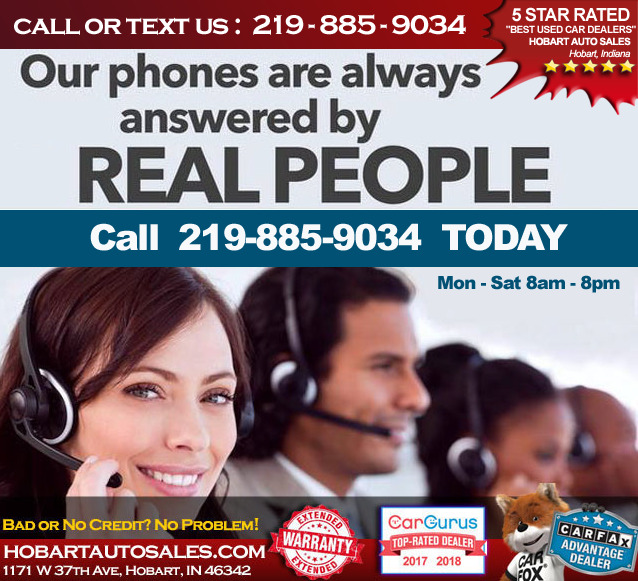 Hobart Auto Sales provides a unique car buying experience to the customers. One that focuses on customer satisfaction first. Our mission is to provide the customer with an enjoyable, honest service by satisfying individual customers transportation needs with a quality product at great prices and excellent service. We know that buying a used car or truck can be intimidating. We don't think it should be. Our goal is to make the used car buying experience low-pressure, honest and friendly. Give us a chance to make you a happy customer. Get a $300 discount on any selected vehicle when you buy a car from us this week.